Innovative Design Replaces Fore-arm with Detached Bag-rider. Gene Beggs operates his own 100-yard indoor tunnel and rifle testing facility just outside of Odessa, Texas. Gene provides instruction and “tunnel time” for serious benchresters looking to improve their skills and optimize the accuracy of their rifles. 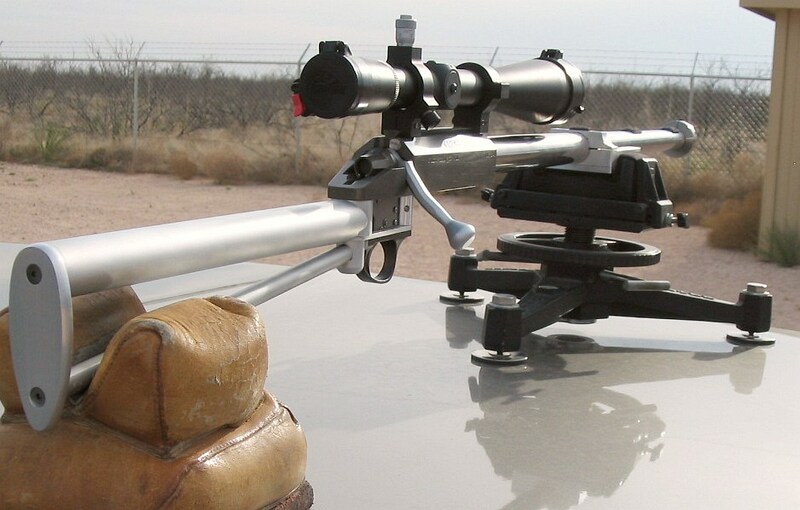 Along with teaching the fine points of short-range benchrest, Gene has been developing two radical new rifles, one chambered in 220 Beggs, a slightly modified 220 Russian, and a second chambered in 6mm Beggs, a necked-up version of the 220 Russian that retains the original body taper and shoulder angle. Both rifles share a skeleton design which uses the Stiller Cobra or Viper action as a central load-bearing member. Remarkably, there is no conventional fore-arm at all. Gene has bolted, directly to the barrel, a 3″-wide bag-riding aluminum sled. 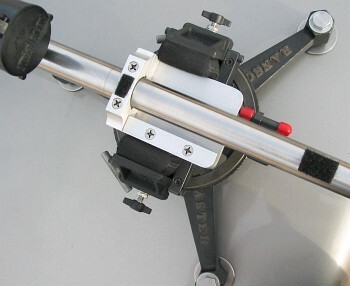 The sled was not designed as a mid-barrel tuner, but it might have some beneficial effects in that regard. However, the tuning functions are handled by two concentric rings threaded to the muzzle. Gene believes that with minor rotations of his front tuning rings, he can dial the gun into tune and the tune can be easily adjusted as conditions warrant. Do Mr. Beggs’ guns shoot? Absolutely. We had the chance to visit Gene in Odessa. We shot both the 220 Beggs-chambered rifle, and its 6mm Beggs-chambered cousin. Both rifles are nearly identical, though the Heavy Varmint-weight 220 has a longer, 27″ barrel compared to 22″ for the Light Varmint 6mm. In the tunnel, the 220 HV, with a no-turn-neck 220 Beggs chamber, produced three-shot groups in the low ones and zeros right out of the gate, even before the tuner was optimized. With a barrel with over 1000 rounds through it, after firing 40 rounds without cleaning, Gene produced a tiny 5-shot group in the low ones. The first shot was slightly high (a common occurence in the tunnel according to Beggs). The last 4 shots, rounds 42-45 since the barrel had been cleaned, went into 0.084″. This rig, though radical in the extreme, certainly appears fully competitive with more conventional BR rigs, and it tracked superbly, with no hopping or rocking on the bags. We were also very impressed with the 220 Beggs cartridge. It’s basically a plain 220 Russian with a sharper radius at the neck-shoulder junction. Gene has commissioned a 220 Beggs reamer with matching seating and full-length sizing dies. The little cartridge achieves 3600+ fps with a 52gr bullet, pushed by Benchmark powder. From what we could tell during our short visit, the 220 Beggs is easy to load for, and performs exceptionally well with either turned (.250″) or no-turn necks. The recoil was noticeably less than a 6mm PPC, making the gun a joy to shoot. This round, we felt, could also be an outstanding varmint cartridge. The velocity is there, and we don’t think any other 22-caliber varmint cartridge is going to beat it for inherent accuracy. Gene sells components (reamers, dies etc.) 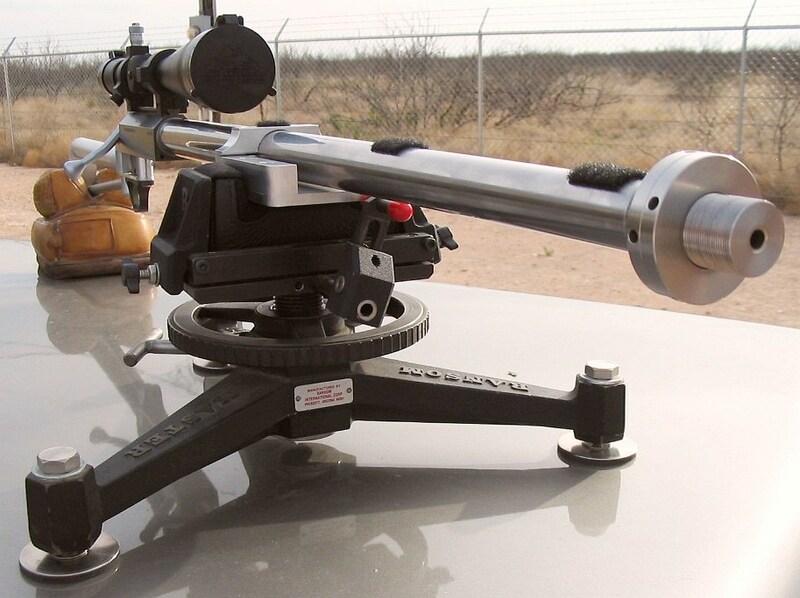 for the 220 and 6mm Beggs, and also offers training/testing sessions in his West Texas Tunnel on an appointment basis. For more information, or to schedule a session, email genebeggs [at] cableone.net.